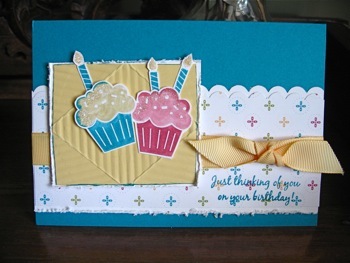 Birthday Cup Cake Cards Can Be Made To Suit Anyone Of Any Age. Birthdays are fun, and cup cakes are delicious - join them together and you get delicious fun! 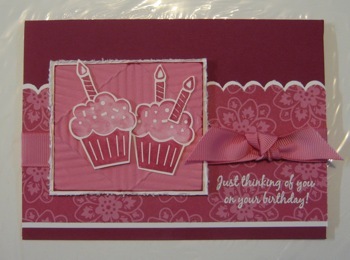 At my recent Stamp A Stack Event one of the card designs was a monochromatic design, quite simple, but very feminine. Now we all know the men in our lives - no matter what age - love a cup cake or two, so I thought I'd give the participants the option of using some slightly more masculine colours on a couple of the cards. Stamp Sets: On Your Birthday, Party Hearty. Inks: Rose Red Stampin Write Marker, Regal Rose Stampin Write Marker, Versa Mark, White Embossing Powder. DS Paper, wide Grosgrain Ribbon, Paper Snips, Embossing Buddy, Embossing Tray. Heat Tool. The picture above shows a detail of the crimped diamond/rectangle. Note how the crimped lines run at different angles to the centre piece. Click on the name to see a tutorial of this technique. 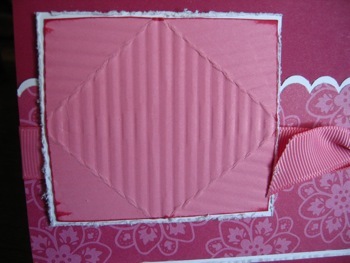 It can be used in many different types of card and is both fun (once you have mastered the folding) and quick. 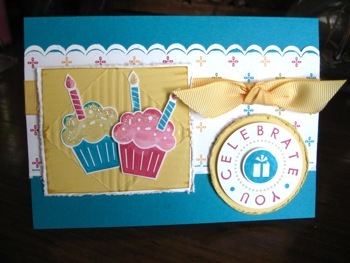 The ripples on the card lend themselves to sponging or dragging an ink pad across the top, and because Stampin Up products all co-ordinate so well, you can be sure that you'll achieve a great result. Here are a couple more examples of using this technique.